The best way to explore in Kathmandu valley by mountain bike. Nepal’s diverse terrain is a mountain biker’s dream adventure comes true. Mountain biking offers an environmentally sound way of exploring this country, its landscape and living heritage. There are plenty of dirt roads and trails in Nepal to meet every mountain biker’s wildest fantasy. It is specially recommended if you wish to explore urban centers of Nepal such as Kathmandu and Pokhara as well as other part of Nepal. Adventures souls may plan extended trips to such exotic locals as Namche Bazar and western Nepal. You could even do the entire length of Nepal across the plains. Nepal is paradise for bird lovers with over 848 species. There is almost 8% of world’s bird population. Among them almost 500 species are found in around Kathmandu valley. The most popular area for bird watching is Phulchoki, Godavari, Nagarjun and Taudaha. Only awe-stricken silence can come close to matching the experience of going on a mountain flight to encounter the tallest mountains of the earth. Mountain flights offer the closest views of Mt Everest, Kanchanjunga and the Tibetan Plauteu. 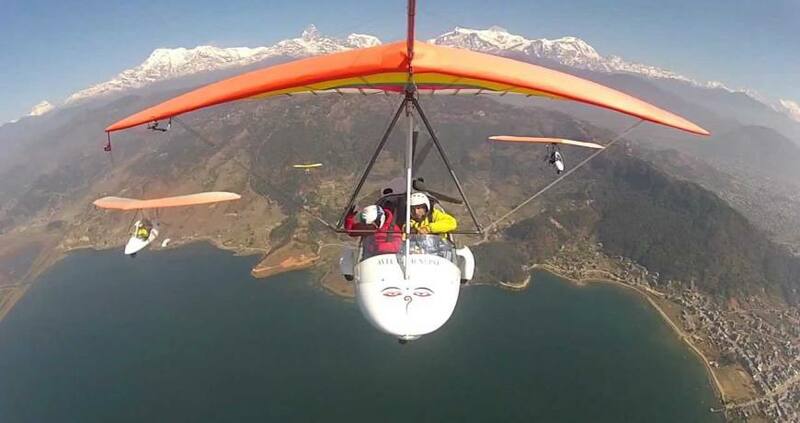 Ultra light aircraft take off form Pokhara and offers spectacular views of the lakes, mountain and villages; this is an ideal way to see life form a new perspective. The choice of the Pokhara Valley for ultra-light aircraft is appropriate chiefly because of the proximity of the mountains, and the scenic lakes. For those who wished they could fly like birds when growing up, this flight is a must. It might be lonely at the top, but the spectacular view from up high certainly makes it all worth it. Flights are from the Pokhara airport beginning September through June. The flights take place from sunrise to 11 a.m. and from 3p.m. to sunset every day during these months. The ultimate thrill of a bungy jump can now be experienced in Nepal at one of the best sites that this sport can boast of anywhere in the world. Nepal’s first bungy jumping site is situated 160m. Over the Bhote Kosi River, inviting you to experience the ultimate adrenaline rush in the surroundings of this amazing place. The jump, at 160m, is staffed an operated by some of the most experienced jumpmasters in the business. Cable –car is a recent phenomenon in Nepal that has become extremely popular with the locals and tourists alike. The 10-minute cable-car ride takes the visitor to the temple of Goddess manakamana who is beliecd to have the power to fulfill wises. The temple of Manakamana lies 125km to the west of kathamndu. Cable car ride starts at Cheres, 104Km form Kathmandu on the highway to Pokkara. Paragliding in Nepal can be a truly wonderful and fulfilling experience for the adventure seeking. A trip will take you over some of the best scenery on earth, as you share airspace with Himalayan griffin vultures, eagles, kites and float over villages, monasteries, temples, lakes and jungle, with a fantastic view of the majestic Himalayan. Gliding is a weather dependent sport and the flying season in Nepal commences from November through February, the best months being November and December. The take – off point for these flights is Srangkot (1592), which also offers prime views of Phewa Lake and the mountains at sunrise and sunset (Provided the skies are clear) and the landing is by the lake, No previous experience is required as qualified pilots provide a short briefing before launching. Hot air Ballooning is very popular with tourists for it affords the most spectacular bird’s eye of the Kathmandu Valley and the Himalayan ranges towering in the background. On a clear day it’s superb way to view the Himalaya, and the view of the valley is equally breathtaking. Village Tours allow visitor to experience a stay in a typical Nepali village. You will get to stay in home of one of the villagers and during your stay, you will get delicious local food and drink and comfortable accommodation provided by your host family. You will also get a change to interact with villagers and get to know their culture, tradition and way of life first hand. Besides, you will be contributing directly to the welfare of the village. Village Tours are conducted in Sirubari, Gorkah and other places. Special interest tours are conducted in Nepal throughout the year to match all tastes. Lepidopterology in one, since eleven of the 14 families, of butterflies are found in Nepal, These exotic species are especially visible in the summer and the monsoon season. Similarly, fossil hutting, archeological, historical toes, game hunting, village tour and other special interest tours take place throughout all seasons. Nepal provides the solitude and environment for mediation which is unparalleled in this part of the world. Nepal has much to offer to those interested in meditation, yoga and Ayurveda. There are guided and residential course for meditaion and yoga and the effect are far-reaching and cumulative. Kathamdu, in particular, is where must of these activates happen.